Pip is one of those homeschoolers who looks bewildered when people ask "what grade are you in?" Following the age requirements of Kentucky, where we currently reside, she would have just finished kindergarten. In our homeschool co-op, though, the first grade class was the better fit this past year. Fluidity is one of my favorite things about homeschooling. 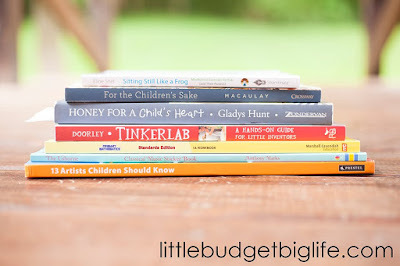 As I plan her first grade/kind of second grade year, these are the books that I'm reading for reference and that I'm currently planning to work with when we get back into our "school year" routine this fall. 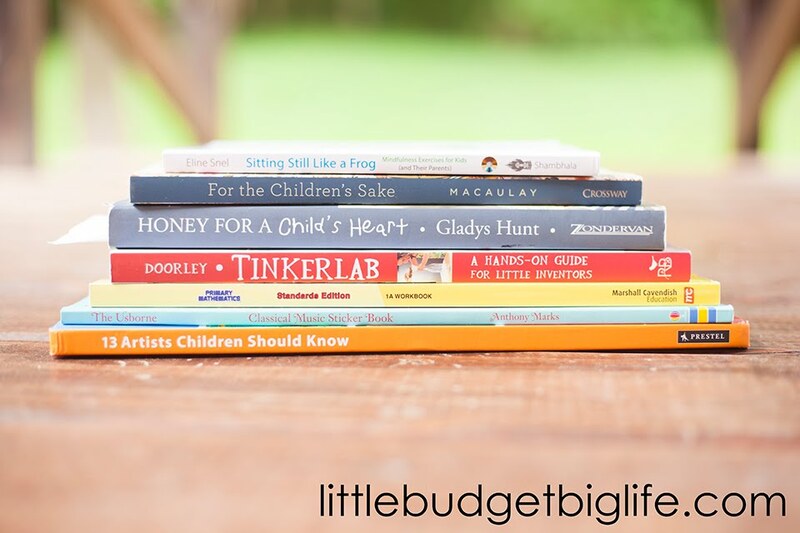 This does not include the picture books and literature that will be utilized daily, as that will be a constant rotation based on her current interests. The majority of those will be borrowed from the library or purchased at McKay Books in Nashville--one of my favorite used bookstores! For life science we'll explore the world around us and take off from there, and history will be examined through the lens of children's lit. There will also be plenty of additional resources pulled in as we go along; this is only my starting point. While I use the term loosely, and we have plenty of crossover between them, the subjects on my mind when contemplating her first grade education are music, reading, writing, science, history, art, math, and life skills. Much of her learning will be done through play (using Shopkins to explore math concepts was a hit this past year), and we'll take field trips to experience science, living history, and performing arts first hand. This upcoming year is going to be a good one. I look forward to continuing to participate in Pip's day to day growth and learning process. It's an amazing gift. Beautiful photo quality. Very Impressed. Thank you for the reminder to be resourceful for books. I need to get back to utilizing the library and used book stores.